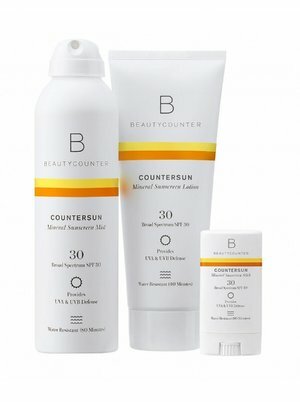 Beauty counter is my go-to brand for non-toxic skincare and makeup because they are leading the industry in research and creation of effective and high-quality products without all the harmful toxins and chemicals that should never have been put into consumer products in the first place. They are socially conscious, very transparent and also do a lot of lobbying in an effort to change the laws governing the skincare and cosmetics industry to become more strict and to ban harmful ingredients from consumer products. It is a company that is creating change for the better which I really like, plus I love their products! The Overnight Resurfacing Peel is my absolute favorite anti-aging product! It improves skin texture and minimizes the appearance of pores, fine lines, and dark spots without irritation or over-drying. It soothes and nourishes overnight to reveal a brighter, more youthful-looking complexion. I’ve really noticed my skin is smoother and a reduction in the size of my pores on my nose, where I struggle with this. The Rejuvenating Eye Cream is definitely the best eye cream for anti-aging benefits. It diminishes the appearance of fine lines and reduces puffiness. I tend to lean toward the Rejuvenating Radiance Serum over the Plumping Facial Oil because it absorbs quicker, but they are both great for anti-aging benefits. You can use both together or just one. Either way you should apply all your skincare products in the order of thinnest to thickest. After cleansing, apply your serums first, then oils, then moisturizers or creams and sunscreen last. Try to allow time for each product to absorb, if times allows between each. Plumping Facial Oil: helps minimize the appearance of fine lines. Perfect for all skin types, especially those concerned with dry skin, loss of elasticity, and fine lines. I only apply the oil at night because it interferes with my makeup application if I apply it in the morning (or i’ve heard of other people who wait 30 minutes after applying the oil prior to applying their makeup).